Arch Address Plaque with Pine Cones - - arch shape one-line sign personalized with the address you specify. Wall mount or lawn mount with optional lawn stakes. Made in USA. Nature theme address sign includes a pine cone emblem inside the arch. One-line sign holds up to seventeen (17) 1.25" characters or up to five (5) 4" characters. The thin border accents the arch shape and is the same color as the pine cones. 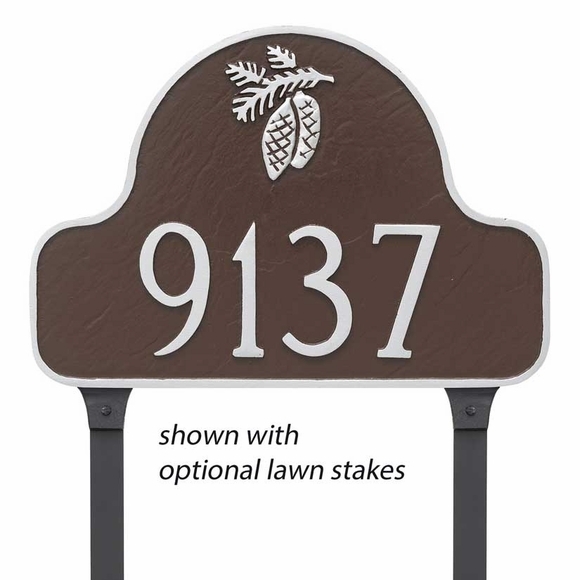 Personalized address plaque with pine cones. Arch shape. Wall or lawn mount. Made in USA. I absolutely LOVE this plaque. It was exactly what I wanted and is very well-made. I can't wait to put it in the yard. Thank you.